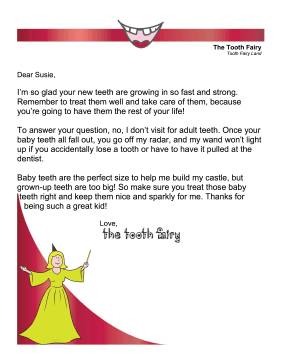 Answer the question of why the tooth fairy doesn't come for adult teeth with this printable letter. I'm so glad your new teeth are growing in so fast and strong. Remember to treat them well and take care of them, because you're going to have them the rest of your life! To answer your question, no, I don't visit for adult teeth. Once your baby teeth all fall out, you go off my radar, and my wand won't light up if you accidentally lose a tooth or have to have it pulled at the dentist. Baby teeth are the perfect size to help me build my castle, but grown-up teeth are too big! So make sure you treat those baby teeth right and keep them nice and sparkly for me. Thanks for being such a great kid!